Our Ford mud flaps are custom made from the finest quality materials available and designed not to tear, peel, fade, rust or break. Our no drill and our standard installation mud guards have an anti-sail design that prevents the mud flap from flying up behind the truck, giving your truck and vehicles around you, increased protection from rock chips. Our Ford truck mud flaps are made with our exclusive “Rain Grooves” that direct rain, snow & road debris down and away from the vehicle. Flat surfaces allow liquids to work their way around the sides to continue to damage your vehicle. 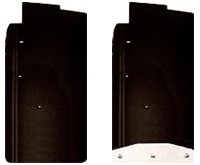 Our full size mud flaps give your vehicle a more complete coverage that splash guards are not able to match. Custom designs are available for modified trucks with lifts, aftermarket flares and oversized wheels or tires. Our drill-less installation mud flaps are available with or without our 304 Mirror Finished Stainless Steel weights, both styles use the same high quality materials and provide great protection. We also create our own custom artwork for these truck mud flaps. Models include F150, F250, F350, F450, Duallys, vans, and splash guards for other models. This Mud Flap for Ford Explorer is a drill-less Mudflap, approximately 12 inches wide by 3/8 inch thick; designed to hang approximately 9 inches below the fender-well. Application: REAR of all 2011 thru 2016 models of FORD Explorer. Serviceability: This drill-less mudflap is designed to work around the protrusion created by the factory flares which make any other full sized mudflap sit at an angle to the tire. This Ford mud flap is a drill-less Mudflap, approximately 12 inches wide by 3/8 inch thick; designed to hang approximately 14 inches below the fender well. Application: REAR of all 2011 thru 2016 models of full size FORD trucks with stock tires and stock suspension looking for extra protection of a towable. Serviceability: This Mudflap is drill-less and requires no drilling of additional holes in your truck. Allows for easy & precise alignment, and drill-less installation. This is a drill-less Mudflap, approximately 14 inches wide by 3/8 inch thick. Designed to hang approximately 12″ below the fender-well. Application: REAR of all 2011 thru 2016 models of full size FORD pickups that have extra wide tires and wheels. Serviceability: This Drill-less mudflap is designed to work around the protrusion created by the factory flares which make any other full sized mudflap sit at an angle to the tire. It gives an extra 1″ coverage on both the inside and outside edge of the tire. This Ford Mudflap is a Pre-drilled Mudflap, 14 inches wide by 3/8 inch thick; designed to hang approximately 14 inches below the fender-well. Application: REAR of all 2011 thru 2016 models of 4×4 Ford full size pickups with extra wide tires and wheels that would like the most protection for their towables. Also a great choice for lifted trucks wanting the extra length. This Ford F150 Mud Flap is a a Drill-less Mudflap, approximately 12 inches wide by 3/8 inch thick; designed to hang approximately 13 inches below the fender well. Application: REAR of all 2004 thru 2010 models of F-150 trucks requiring extra length to protect a tow vehicle, or a truck with a slight lift. This Mudflap for Ford is a Drill-less Mudflap, approximately 14 inches wide by 3/8 inch thick; designed to hang approximately 11 inches below the fender well. Application: REAR of all 2004 thru 2010 models of F-150 trucks with over-sized tires. This Ford F150 Mud Flap is a Drill-less Mudflap, approximately 14 inches wide by 3/8 inch thick; designed to hang approximately 13 inches below the fender well. Application: REAR of all 2004 thru 2010 models of F-150 trucks with over-sized tires, requiring extra length to protect a tow vehicle, or a truck with a slight lift. This Ford Raptor Mud Flap is a Pre-Drilled Mudflap, approximately 12 inches wide by 3/8 inch thick. Designed to hang approximately 8 inches below fender well. Application: FRONT of all 2011 thru 2014 FORD Raptor pickups with stock wheels and tires. If your truck is lifted or has oversized aftermarket wheels or tires, call for custom sized mud flaps. Mounting: DuraFlap mounting hardware is made of stainless steel where available. Other mounting products are made of anti-corrosive and rust resistant materials. This pre-drilled mudflap is custom designed to fit in the Raptor fender well. Serviceability: This Mudflap is Pre-Drilled and allows for easy & precise alignment. This installation will require drilling thru the fender well. This Ford Raptor Mud Flap is a Pre-Drilled Mudflap, approximately 14 inches wide by 3/8 inch thick. Designed to hang approximately 8 inches below fender well. Application: FRONT of all 2011 thru 2014 FORD Raptor pickups with oversized tires requiring extra protection. Make certain that your tires will not rub on the mud flaps when they hang down inside your fender well. If this is a problem, see our lifted truck page. This Ford Raptor Mud Flap is a Drill-less Mudflap, approximately 12 inches wide by 3/8 inch thick. Designed to hang approximately 10 inches below fender well. Application: REAR of all 2011 thru 2014 FORD Raptor trucks with stock tires and stock suspension. This Mud Flap for Ford Raptor is a Drill-less Mudflap, approximately 12 inches wide by 3/8 inch thick. Designed to hang approximately 12 inches below fender well. Application: REAR of all 2011 thru 2014 FORD Raptor trucks with stock tires and a slight lift, or those wanting to protect a tow vehicle. This Ford Raptor Mud Flap is a Drill-less Mudflap, approximately 14 inches wide by 3/8 inch thick. Designed to hang approximately 10 inches below fender well. Application: REAR of all 2011 thru 2014 FORD Raptor trucks with extra wide tires. This Mud Flap for Raptor is a Drill-less Mudflap, approximately 14 inches wide by 3/8 inch thick. Designed to hang approximately 12 inches below fender well. NOTE: If you have added the full inner fender well liner, the fit up is different. Let us know you have the liner on the questionnaire when ordering. Application: REAR of all 2011 thru 2014 FORD Raptor trucks with extra wide tires and a slight lift, or those wanting to protect a tow vehicle. This Ford Mud Flap is a Drill-less Mudflap, approximately 14 inches wide by 3/8 inch thick; designed to hang approximately 11 inches below the fender well. Application: REAR of all 2011 thru 2014 models of F-150 trucks with oversized tires. Serviceability: This Mudflap is Pre-Drilled and allows for easy & precise alignment. Please Note that if your truck does not have flares around the fender well, and you have added the optional rear fender well liner; this installation will require drilling thru the cloth fender well liner. If your truck does have the fender well flares, this is a drill-less installation. 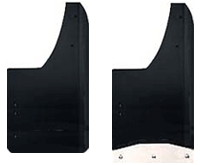 This Ford Mudflap is a Drill-less Mudflap, approximately 14 inches wide by 3/8 inch thick; designed to hang approximately 13 inches below the fender well. Application: REAR of all 2011 thru 2014 models of F-150 trucks with oversized tires, requiring extra length to protect a tow vehicle, or a truck with a slight lift. This Mudflap is approximately 14 inches wide by 27 inches long by 3/8 inch thick. Application: REAR of All trucks with oversize wheels and tires as well as lifted body trucks that are now very popular. Mounting: This Mudflap is bolted with included Stainless Steel bolts, nuts and washers and has two galvanized brackets per Mudflap to ensure stability in adverse conditions. Serviceability: Mudflap of choice for professional hi way haulers and those that demand the maximum in protection for both their truck and towables.